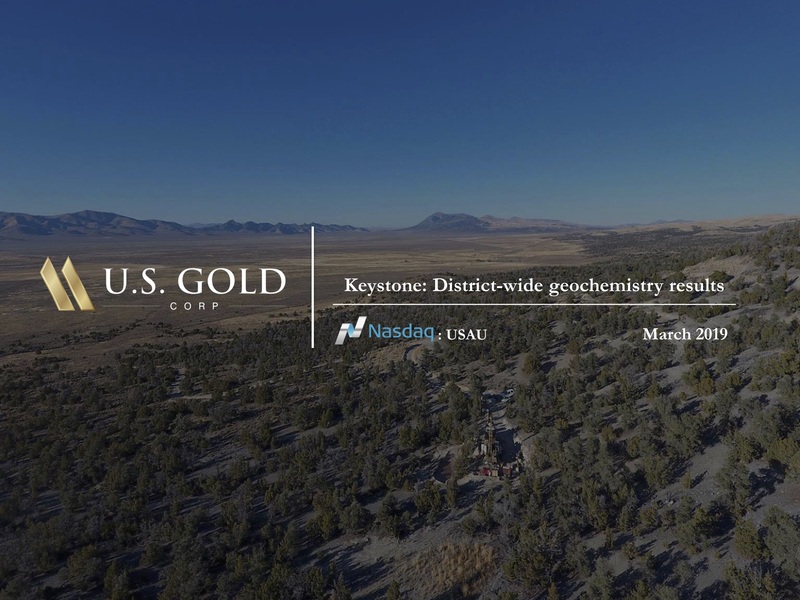 U.S. Gold Corp. has significantly added to the blanket geochemical sample surveys covering the 20-square-mile Keystone district project area. The sample database now comprises 7372 soil samples, 3,414 rock samples, 666 fine-sediment stream samples, and 661 altered stream cobble samples. The primary designed purpose of the multifaceted 2018 geochemical surveys was to follow-up on existing anomalies and provide more definition to prior geochemical surveys in order to identify and define site-specific gold targets to be drill tested in 2019. 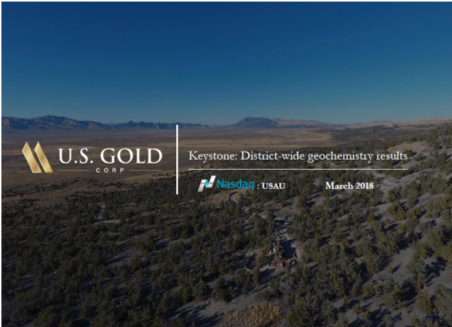 The highly anomalous geochemical levels and widespread distribution of metals being sought, in particular gold, along with associated pathfinder metals, clearly demonstrate the presence of a very large, robust gold-bearing, district-wide, multi-metallic hydrothermal system at Keystone. 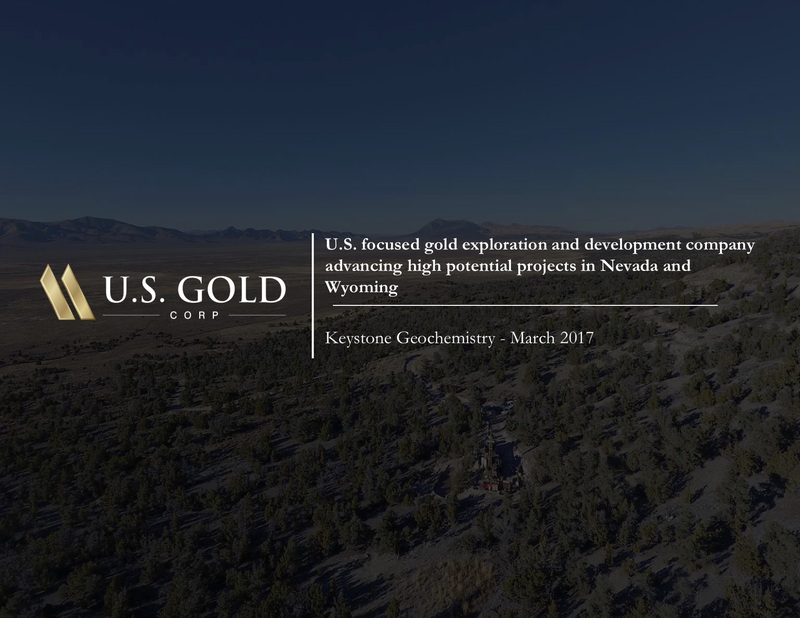 All age/gold system timing data indicate that the Keystone hydrothermal system is early Tertiary in origin and similar to those that host the major Carlin-type gold deposits in Nevada. Specifically, age dating of illite alteration of andesite dikes and sills associated with collapse breccias at Keystone (Gabriel Aliaga, 2018 University of NV Master's Thesis), has provided dates of 35.71 +/- 0.12Ma and 35.54 +/- 0.06Ma which are very comparable in age to mineralization related age dates of 35.70 +/- 0.14Ma to 35.31 +/-0.37Ma from the Cortez Hills gold deposit to the northwest of Keystone (ref. Arbonies, DG, Creel, KD, and Jackson, ML, 2010, Geol. Soc. of NV Symp. Vol., p.457).